There are about as many uses for Factual’s dataset as there are data points. Today, we leveraged this power to solve one of life’s more important questions: which is more popular New York or Chicago style pizza? To find the truth, we cracked open our Restaurants Data1 and took a look at how many pizza spots in the US label themselves as providers of thin crust or deep dish. To compare the popularity of the two culinary approaches, we queried all restaurants serving pizza in the US, with either “New York” or “Chicago” in their names2. 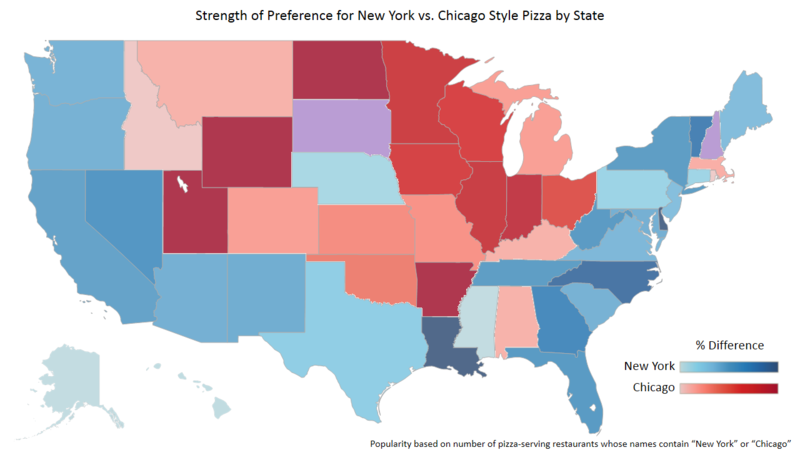 Though this metric may underestimate the absolute number of establishments serving New York or Chicago style pizza, it gives us a strong idea of the perceived popularity of each (we assume that owners chose to include pizza style in their restaurant names because they know it appeals to their customers). On a countrywide basis, New York style claimed about 16% more restaurants than did Chicago style. This could easily be driven by regional preferences and the higher population of New York over Chicago. To get a better understanding of how preferences may shift by region, we examined the relative popularity of each style on a state by state basis3, summarized in the map below. 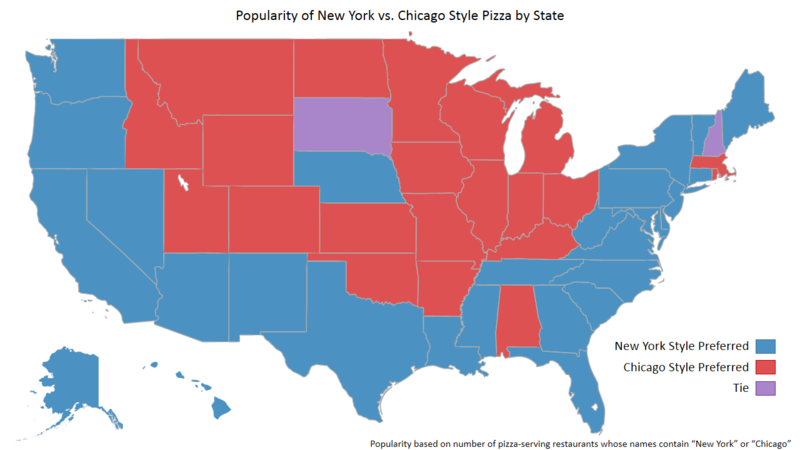 Our findings show that New York style claims 27 states over Chicago style’s 21 states and Washington DC. Generally speaking, New York style seems to prevail in the coastal and southern states, while Chicago style holds fast in the middle of the country. An outlier to the this trend is Massachusetts: one cannot help but wonder if it is a result of the deep rivalry between the cities of New York and Boston. Another interesting feature of this analysis is that the states of South Dakota and New Hampshire present ties. To make it clearer how dedicated people across the nation are to their preferred pies, we built a second map to illustrate the percent difference in the numbers of each type of restaurant in each state. To bring this project a little closer to home, we took a poll of Factual employees to see how they swayed. We found that 61% of participating employees chose New York style (this can likely be attributed to strong representation from “New York preferring” states, with 82% of those polled hailing from states that prefer New York style). By the numbers, the predilection for New York style pizza seems to have claimed a larger slice of the nation. Leave us a comment and let us know your preference and where you’re from! To access our Restaurants Data, either use your existing API key (or get one here) or request a download. 1. Our Restaurants Data is an extension of our Global Places Data. It contains over 1.1 million restaurant listings in the US and over 200,000 in the UK. In addition to the core data attributes that we offer for all of our Global Places listings (name, address, etc. ), we provide 43 attributes that apply specifically to restaurants.